Galerie Louise Leiris, Paris (17206/5928). Anon. sale, Sotheby's New York, 12 May 1994, lot 253. Sold with a photo-certificate from Quentin Laurens of Galerie Louise Leiris, dated Paris, le 28 juin 1990. 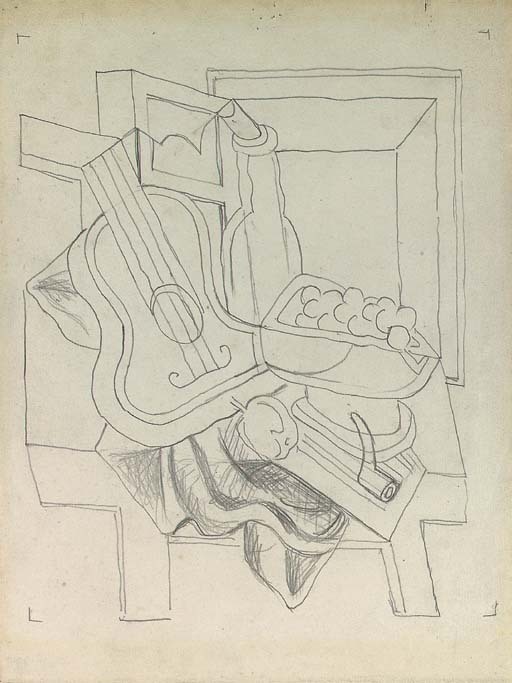 The present work relates closely to a drawing which was formerly in the collection of Douglas Cooper (1911-1984), the celebrated art historian and critic, who at one time owned one of the most important collections of Cubist works of art (see illustration). Elements of Nature morte, guitare et compotier can be found in a number of oil paintings from the period, notably La table et le fauteuil (Cooper 500), La lampe élèctrique (Cooper 526) and Mandoline et compotier (Cooper 531). Commenting on Gris' work of this period, Douglas Cooper wrote: 'Gris thus once again treats his still lifes as if they were sculptural reliefs, which gives them an almost emblematic meaning... These still lifes are distinguished by a gravity and a certainty of execution, as well as a grandeur of conception which is seemingly reached without effort. They represent a pivotal moment in Juan Gris' all too short artistic life.' (Translated from: D. Cooper, Juan Gris, Catalogue raisonné, Paris 1978, p. XXVII).